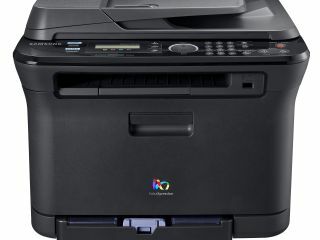 If you are a fan of quality printing yet don't really like massive bulky laser printers in your home office (and really, who does?!) then Samsung's boast that its new laser printer is the smallest in the whole wide world will no doubt impress you deeply. This "multi-talented, four-in-one, wireless colour laser printer" is memorably named the 'CLX-3175FW' and "guarantees an ultra high-resolution output in copy, print, scan and fax, along with a small, compact footprint, giving you maximum space saving and value for money." Tech wise, the printer features Samsung's "revolutionary No Nois™ Technology engine design", which is like using the word noise, but without the e and then adding a small TM after it. Snide swipes at poor product naming aside, the fact that the printer is small, looks cool and is also quiet does seriously impress us. Samsung's release continues: "The CLX-3175FW's 2400dpi x 600dpi fine print resolution ensures all documents are produced with clarity and detail. A 20,000 page per month duty cycle means it is built to withstand the heaviest workloads, and its fast colour and mono print and copy speeds allow you to add colour with definition to all business documents. Anne-Marie McGarry, Consumer Product Marketing Manager for Print at Samsung Electronics UK sums the whole thing up in one delicious soundbite, saying: "It's a beautiful model, ready to fit into the smallest of places, yet with the features of a robust machine." Stay tuned for TechRadar's full, robust testing of this new printing marvel as soon as we get one in to print and play with.